Never Enough Nails: OPI San Francisco Liquid Sands! I thought I'd kick off my OPI San Francisco Fall 2013 collection swatches with the Liquid Sands, since I am having such a texture polish moment. I keep grabbing Liquid Sands when I need a fast, long-lasting mani (a.k.a. basically all the time). For example, the other day I did OPI Honey Ryder in the car on the way out!!! For the record, I wasn't driving. The San Francisco collection has three new Liquid Sands for me to add to my texture collection and this hot chocolate specimen is OPI It's All San Andreas's Fault. I didn't think I would like this polish, since it's not a glitter texture, but I really love it! It's a nice warm taupe-y neutral, and it doesn't look lumpy or gross. It's All San Andreas's Fault was opaque in almost one coat, I did two for full coverage. It was also lovely to apply and not at all thick or lumpy like you might think. It's almost like the texture appears after the polish is on your nails. I did not top coat this or Wharf! Wharf! Wharf! because it just looks like a regular creme in this color. 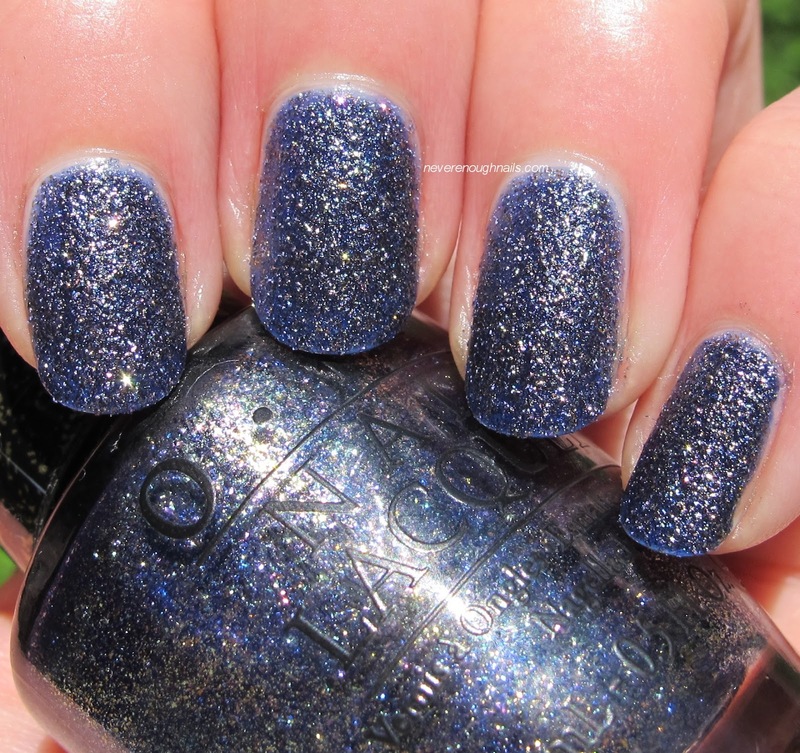 Color: two coats OPI Wharf! Wharf! Wharf! I didn't think I'd like OPI Wharf! Wharf! Wharf! either, but it's surprisingly pretty! Wharf! Wharf! Wharf! 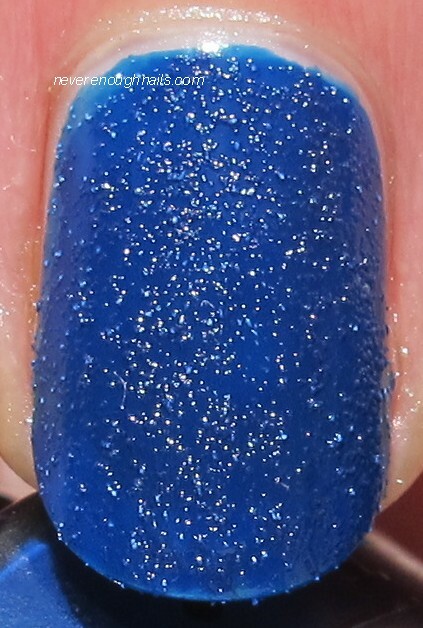 is a very saturated bright cobalt texture. 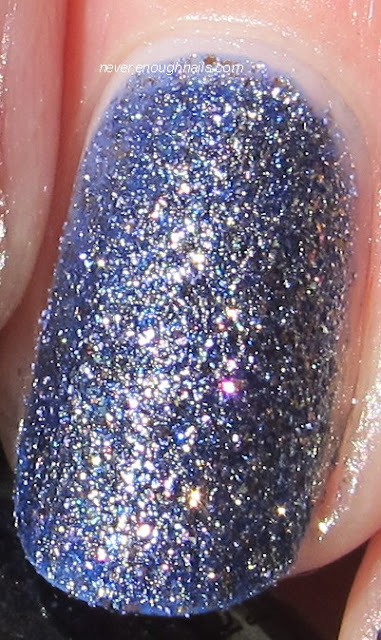 I thought this one was one of the non-glitter textures, but it kind of looks like it has silver glitter hidden in there, so it's not completely flat/matte. It is brighter on the nail than it appears in the bottle. I thought my nails were completely dry when I took these pictures, but they look a little glossy to me. The Liquid Sands always take awhile to dry to their real finish, but this was dry to the touch. Wharf! Wharf! Wharf! was as easy to work with as San Andreas. This is two coats and it looked nice and opaque. It was a little bit thinner feeling than San Andreas, but that didn't cause any problems for me. 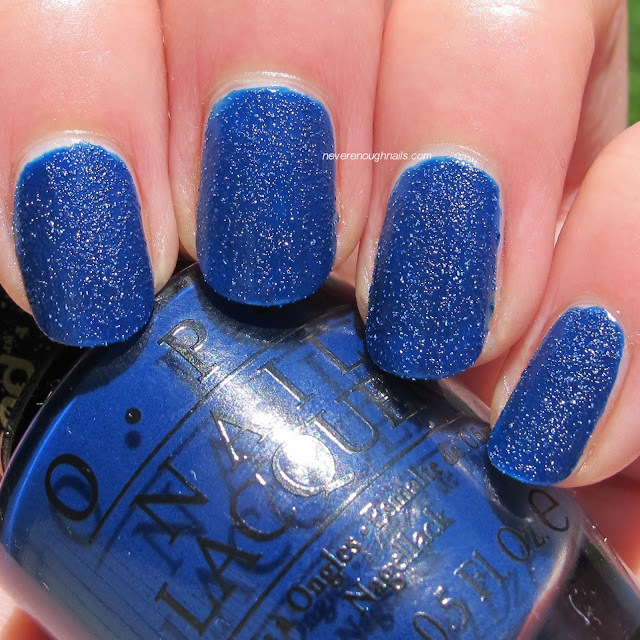 Ahhh, the one we've all been eyeing since the preview pictures first surfaced- OPI Alcatraz Rocks. Alcatraz Rocks is a stunning glittery steely blue-gray multi-colored shimmer Liquid Sand. You catch flashes of all sorts of different colored glitters, depending on the light. All the shimmer kind of confused my camera so the shade picture is actually more accurate than the sun. Alcatraz Rocks was also a dream to apply. Look at how close I got to the cuticle! These pictures are with no clean-up. I did three coats of Alcatraz because I thought it would be one of those polishes that my camera likes to make look sheer, but I would probably do two coats to wear. 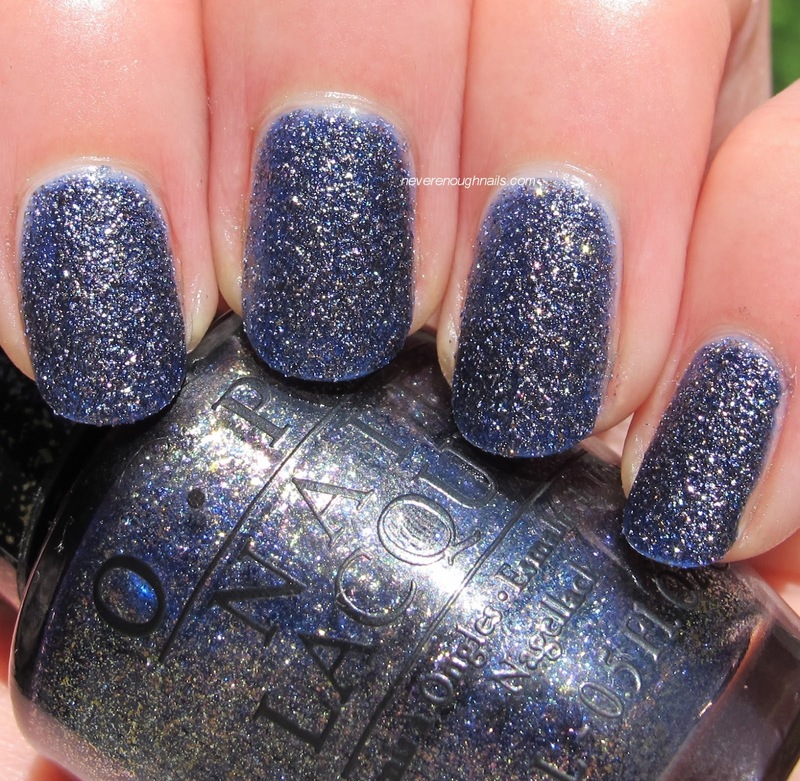 Here is Alcatraz Rocks with one coat of Gelous. Stunning, right? This is one to buy even if you hate textures. So far, I am really pleased with the first three polishes from OPI San Francisco. I wasn't expecting to like the non-glittery textures, but I really do! And I knew I would love Alcatraz Rocks, but I really really love it! I am expecting that it will be my go-to fast mani polish this fall. I can't wait to try the rest of the collection!! I LOVE fall polish! I like Alcatraz Rocks, but I'm not a fan of the textured creams. That's totally understandable, I thought I'd hate them too! Alcatraz Rocks is really beautiful though!